By QWAFL Writer Jess Stewart. 2016 is shaping up as a huge year for University of Queensland, with some major changes made to both the playing list and the coaching team. The QWAFL team welcomes new head coach, Damien Richards, former premiership winning coach with the Coorparoo QWAFL team. Damien brings a wealth of experience in women’s football to the role and has the ability to transform this team into a serious finals contender. Tim Sparkman, the new QWAFA coach and Rach Anstey, the new QWAFL assistant coach will also add adepth of knowledge to the club. Along with these changes, comes the inclusion of joint 2015 QWAFL Best & Fairest winner and former Coorparoo captain, Emma Zielke along with some of her premiership winning teammates. It will be interesting to see how these new players fit into the team and whether Breanna Koenen and Emma Zielke will make a significant impact on the competition, together in the midfield. Overall, it’s predicted that UQ will become formidable finals contenders this year, and will carry their strong end of season form into 2016..
Keep your eyes peeled for round one when UQ take on Coorparoo in what’s set to be a cracking game, full of emotion. 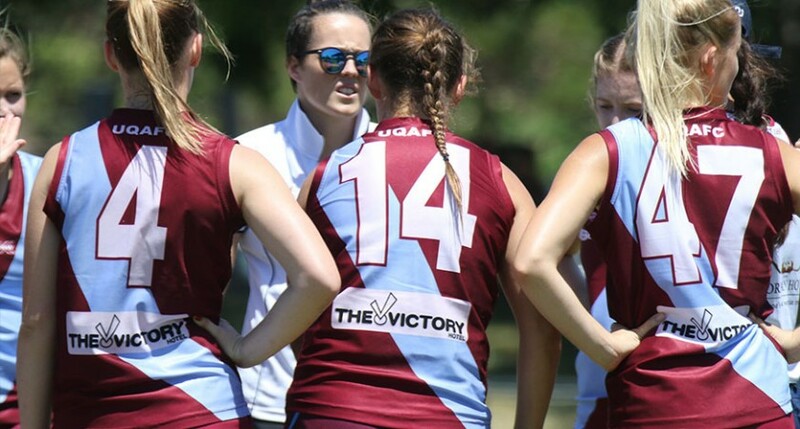 Rising Star: Alanna Perry – I think the Queensland U18 representative will really embrace playing footy at a higher level;not sure whether she will be playing QWAFL or QWAFA, but I think she has the potential to push for senior selection. She holds up the backline, reads the play superbly and has the ability to go through the midfield, but may not get many chances with the depth of Emma Zielke and Breanna Koenen. I’m really looking forward to seeing how she transitions from Youth Girls to the QWAFL, and how handles the increase in physicality. Who are the top 3 players to watch in your team? Which 2 teams be playing in the 2016 QWAFL Grand Final? Who’s your predication for 2016 QWAFL Best & Fairest? What’s your best piece of coaching advice/favourite coaching quote?